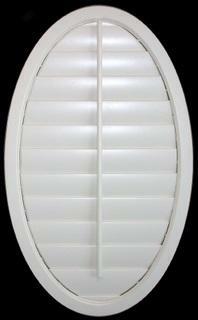 Gator Blinds® is the only Company who sells AluCore Poly Shutters® with an Aluminum Core in the Stiles and Louvers ! insulating factors up to R-Value 5.9 ! Superior energy efficiency – 70% better than wood and 1,600% better than aluminum. Saves Money. Amazing appearance and low maintenance Lead-free. delivered and installed in 2 weeks. – Crafted with the finest solid Poly materials using the latest technology. – It is a harder material surface, reducing the likelihood of dings and dents. – Aluminum inserts provide added strength and rigidity. 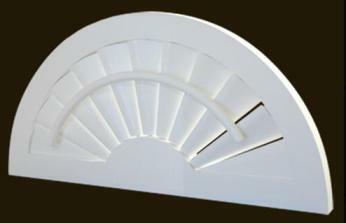 – Aluminum reinforced in all our louvers and stiles makes this shutter arrow straight. 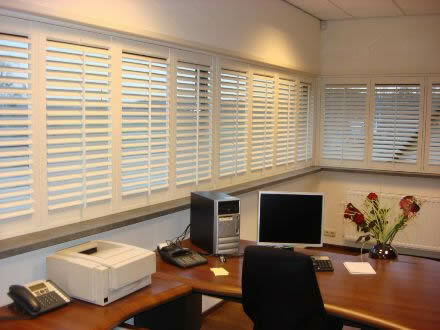 – Composite Wood or Polywood shutters are limited to a louver width of 28 inches. 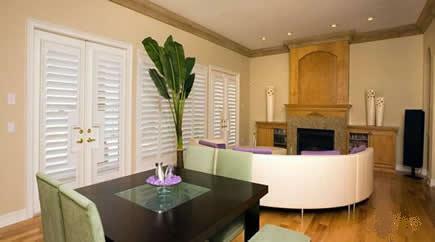 – ALUCORE Poly Shutters plantation shutters can have panel width up to 36″ wide! 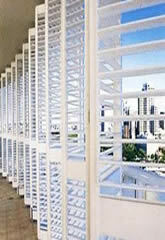 – ALUCORE Poly Shutters® aluminum core makes wider louver lengths possible. – Wider panels are available for a cleaner and less obscured view out of the window. 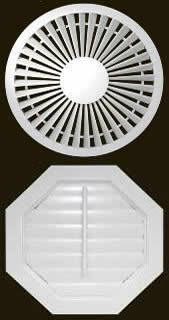 – Louvers available in 2-1/2, 3-1/2, 4-1/2 for a spacious “plantation shutters” look. 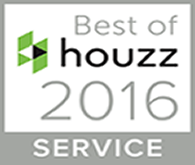 – Fully framed inside or outside mount to ensure the best look and fit for your windows. – Shutters are actually screwed together for superior strength. – Energy Efficient superior R-Value – better insulation than wood. – Superb light, noise and temperature control! – AluCore Poly Shutters are Green and Eco-Friendly! – Environmentally friendly – Recyclable Material – No need to cut trees. – UV-resistant – Paint-Protected – Non-Toxic water based Paint Finish. – No harmful gasses emitted by AluCore Poly Shutters®. – Moisture and humidity resistant – Insect Resistant. – Fire Resistant – Fully repairable! – Elliptical louver profile. – Most Durable – will not yellow, crack, chip, split or warp – waterproof. – Hypoallergenic and unaffected by bacteria and termites. – Cleaning only requires a damp cloth or mild soap and water. – Minor surface imperfections can easily be removed. – Limited lifetime manufacturer warranty. ALUCORE Poly Shutters® are made of a solid synthetic foam with a co-extruded aluminum core. 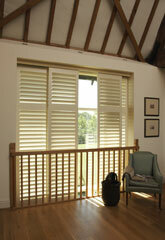 ALUCORE Poly Shutters® are beautifully engineered wood substitute. 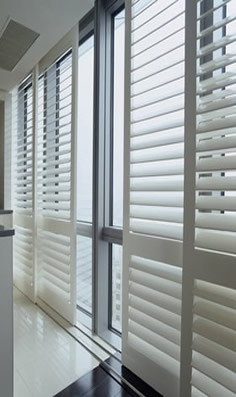 ALUCORE Poly Shutters® are manufactured with the best compound and highest technology. 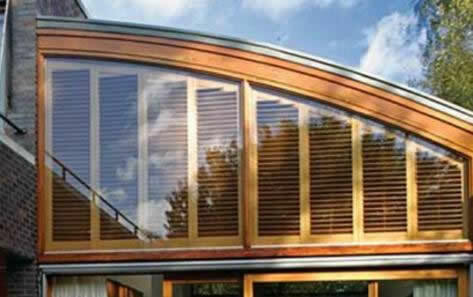 ALUCORE Poly Shutters® have a baked on waterborne paint. 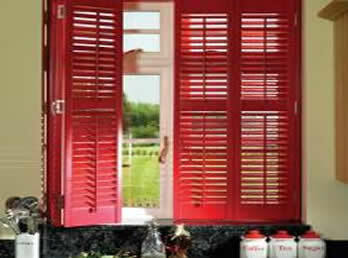 ALUCORE Poly Shutters® are fire retardant, moisture resistant and NON-TOXIC. ALUCORE Poly Shutters® offering a high insulation value against the heat and cold. ALUCORE Poly Shutters® are easy to clean and to maintain. 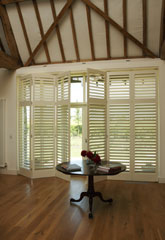 ALUCORE Poly Shutters® are beautiful, upscale alternative to wood at a fraction of the cost. ALUCORE Poly Shutters® have no problem with heat, humidity, and moisture areas. they are a beautiful, upscale alternative to wood at a fraction of the cost ! Durability that is unaffected by moisture. All components are extruded in a free foam method creating superb consistency. Available in custom shapes and sizes. AluCore Poly Shutters ® will insulate 70% better than Wood to save you money. Air conditioning accounts for approximately 45-65% of a single- family dwellings monthly utility bill. Windows can account for 11-24% of this amount. Experts estimate that 20-30% of the summer heat can soak through your windows if not properly insulated. With energy cost ski rocketing, you will appreciate the products that will conserve energy. When making the stiles and louvers, an aluminum core is co-extruded into the solid polymer. This provides for enhanced rigidity and durability. The aluminum core is hidden inside the components and makes them much stronger. It makes them so strong that ALU CORE Poly Shutters® can be built with individual shutter panels up to 36 inches wide! This does not limit the allowable window width, however. By using multiple panels and intermediate T-posts, almost any window can be covered. When the sun heats those cheaper louvers, they WILL sag. Further, the shutter panels themselves will sag. 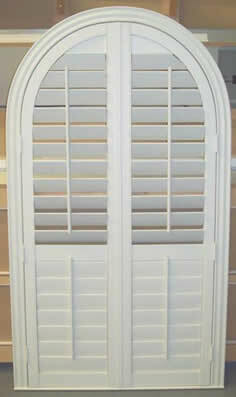 This is why most other polymer shutters are only available with panel widths out to 28 inches or so. 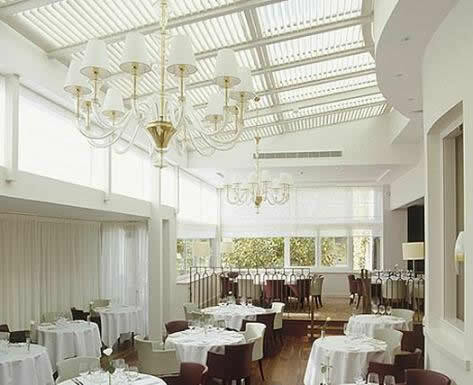 They can not span the extra distance without noticeable sag in the louvers and the shutter panels. One other important detail is that ALU CORE Poly Shutters® plantation shutters are screwed together at the joint of the rail and stile. The screws are run through the aluminum reinforcing in the stile into the aluminum and then capped. This produces a much stronger joint. The screw together format also has a terrific advantage in that it makes the shutters extremely repairable. Of course, it takes a lot to damage ALU CORE Poly Shutters ® plantation shutters, but if someone was successful in doing it, repair is quick and easy. For example, if someone bent a stile, we would not need to ship you a new shutter panel. We could simply ship you a new stile. You would remove the screw caps, unscrew the stile, and screw on a new one. Replacing rails and louvers are done in a similar manner. Not all polymer shutters are created equal. Not only does ALU CORE Poly Shutters® have the hidden aluminum reinforcing, but it also has a harder shell which is resistant to dents and dings. They also have self tensioning louver pins, so you never need to adjust the louver tension. 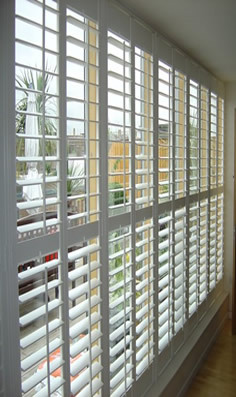 With ALU CORE Poly Shutters® baked on finish, the only way they usually get dirty is if dust settles on them. An occasional dusting is all that is needed. Even if someone with greasy hands touches them, there is no need to worry. 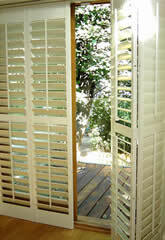 Unlike wood interior plantation shutters, ALU CORE Poly Shutters® can be cleaned with almost anything. Do not use anything with abrasives or solvents, but normal household furniture cleaners are just fine. ALU CORE Poly Shutters ® plantation shutters are actually more versatile than most other types of shutters, whether they are made of wood or poly material. They come with 2-1/2, 3-1/2, or 4-1/2 inch wide louvers. They are available in specialty shapes to cover odd shaped windows including archtops and lazy archtops in both sunburst style and standard horizontal louver style. They come in rake tops, hexagons and octagons, again in sunburst and standard style. They can even be put over French doors and sliding glass doors. One of the best ways to cover a sliding glass door is with ALU CORE Poly Shutters ®. A sliding glass door is used often. Not only are the louvers tilted open or closed, but the shutter panels themselves can slide open and shut. The durability and rigidity of ALU CORE Poly Shutters ® are a perfect match for this application. We highly suggest the use of overhead tracks with sliding glass doors for ALU CORE Poly Shutters ®. Next are some details about ALU CORE Poly Shutters ® and overhead track systems. However, be sure to reference Plantation Shutters Over Sliding Glass Doors for more details and ways to cover sliding glass doors. 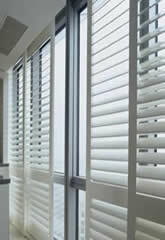 ALU CORE Poly Shutters ® provides for 2 types of track systems: Bi-Fold and Bi-Pass. Both track systems contain a 3/4” top header (mounting/dust board) to which the aluminum track is mounted. Two side legs are also supplied (if needed) to prevent light leakage and to stop the shutter panels. A valance is used to cover the aluminum track at the top to provide a finished look. Bi-fold Plantation Shutters ® contain shutter panels that are hinged together and therefore fold against each other, similar to a closet door. The track helps to guide and support the panels. Bi-fold panels can be configured to where panels open all to one side or to where they open to both sides of the door. Panels must be hinged together in multiples of two. A special frame is used with Bi-Fold track systems that supports the track and minimizes light leaks. Bi-Pass track systems are when two or more shutter panels are hung from an overhead track and slide behind and past each other. Note that the louvers must be closed for the shutters to slide past each other. Bi-pass plantation shutters are a great option for where space is an issue since the panels never protrude into the room. This configuration is only available with a double or triple (or more) overhead track. An extended overhead track is also available that allows the plantation shutters to be slid completely past the door for full view. 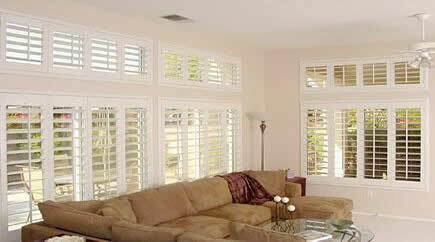 The full life cycle cost of ALU CORE Poly Shutters ® plantation shutters is quite low. You can replace other window coverings several times during the lifecycle of a ALU CORE Poly Shutters ®. Further, ALU CORE Poly Shutters ® costs much less than ANY comparable product…that is if a comparable product exists. 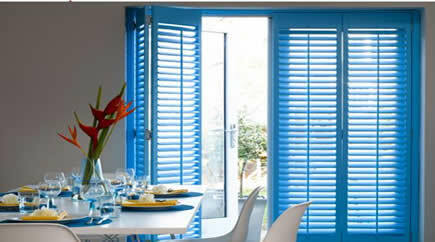 They cost less than PolyWoodTM which in our opinion is not near the quality of ALU CORE Poly Shutters ®. Due to better manufacturing processes and higher efficiencies, you pay less. Even better, all assembly takes place right here in the United States. 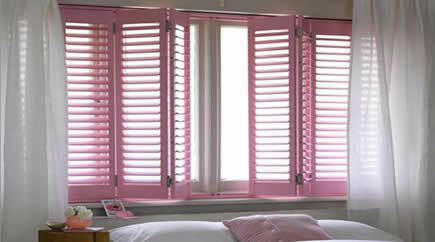 For a quote, please visit Pricing for Custom Made Plantation Shutters, or Contact Us with your details. We will be happy to price anything you require. 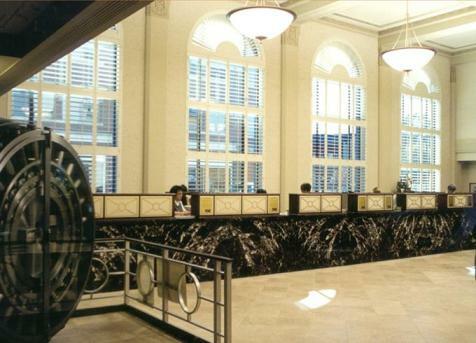 Plantation shutters are the perfect window covering for hospitals, hotels, restaurants, office buildings, and other commercial applications. For superb style, durability, and versatility there is no better choice. Altamonte Springs, Apopka, Astatula, Bay Lake, Belle Isle, Brevard County, Casselberry, Celebration, Clearwater, Clermont, Cocoa Beach, College Park, Davenport, Daytona Beach, Debary, Deland, Deltona, Dr Phillips, Edgewater, Edgewood, Eustis, Fern Park, Ferndale, Florida, Forest City, Geneva, Goldenrod, Gotha, Grand Island, Groveland, Haines City, Heathrow, Hillsborough County, Howey in the Hills, Isleworth, Kissimmee, Lady Lake, Lake Buena Vista, Lake County, Lake Mary, Lake Monroe, Leesburg, Longwood, Maitland, Mascotte, Melbourne, Merritt Island, Metro West, Minneola, Montverde, Mount Dora, New Smyrna Beach, Oakland, Ocoee, Orange City, Orange County, Orlando, Ormond Beach, Osceola County, Oviedo, Palm Beach, Palm Coast, Pinellas county, Plyouth, Polk County, Port Orange, Reunion, Saint Cloud, Sanford, Seminole County, Sorrento, St. Petersburg, Sumter County, Tampa, Tavares, The Villages, Titusville, Umatilla, Volusia County, Windermere, Winter Garden, Winter Park, Winter Springs, Yalaha.